I moved to Lisbon one rainy afternoon when the sky looked like it was painted by a sad expressionist. First, I was surprised by the grey colours above me. I've always thought that Portugal is an extremely sunny place, and optimistically, I packed only bikinis and colourful dresses in my huge suitcase. I was looking up in wonder and a little bit of fear. Why is my first day in Lisbon like this? The sun will come out eventually, right? But in the next few weeks, Lisbon surprised me with colours I didn't expect. Sure it was windy and rainy at first, but when the clouds moved away it was like the sun lighted a candle inside me that ever since never stopped burning. I fell completely in love with the atmosphere, the people and charming architecture. Get lost in the colourful labyrinth of streets with houses, covered with typical Portuguese tile art (azulejos). You'll find many miradouros (viewpoints) from which you can observe the city, and eventually, you'll also find a huge Cathedral (the oldest one in Lisbon) and São Jorge Castle. I strongly recommend you to visit a castle, and if you will stay in a city for a longer time (e. g. for Erasmus study exchange) you can even get in it for free; you only need to prove that you live in Lisbon. A copy of your apartment contract will do. Otherwise, if you are in Lisbon just as a tourist, you'll need to pay the 5 euro entrance fee. You should continue your exploration of the city at its centre point, which is located next to the huge Tagus river. The locals also call it Terreiro do Paço or The Palace Yard. That name originates in the old times when next to the square stood a beautiful Ribeira palace that belonged to the Portuguese royal family. The palace was destroyed in the great earthquake of 1755 that ruined a big part of the city, especially the buildings next to the river. The fire and tsunami have brought destruction to many families and houses, and if you take a walk under the Arco da Rua Augusta (Arc of the Augusta street) towards Praça da Figueira, you'll see many different buildings that were rebuilt after the catastrophe. If you walk from Praça do Comércio on the banc of the river, you will soon walk under the magnificent shadow of a huge bridge that marks the view of the city on almost every postcard from Lisbon. 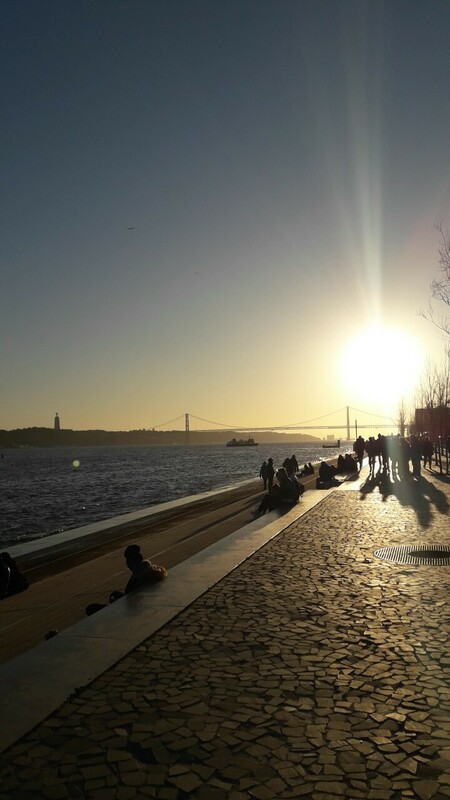 The name of the bridge commemorates the date of the Portuguese revolution in 1974, during which the military and civil resistance lead to the end of the totalitarian regime of an authoritarian Prime Minister of Portugal, António de Oliveira Salazar. Many say that the bridge resembles the looks of the famous Golden Gate bridge in San Francisco; unlike in case of that one, you can't walk on the Ponte 25 de Abril. You can only drive over it with a car, a bus or a train. If you want to cross the river and get from Lisbon to the southern side of Tagus, you can also take the ferry. The bridge is approximately in the middle of the way from Praça do Comércio to Belém, which should be your next stop. If you continue walking, you'll soon reach Belém. It is a beautiful part of the city where you can find many galleries, museums and parks. You'll probably want to visit famous Jerónimos Monastery which is a UNESCO World Heritage Site (Torre de Belém is also one). On the way to there don't miss MAAT (Museum of Art, Architecture and Technology), and if you make just a little turn out of your way to the right, you will arrive at famous LX Factory. That is a street full of unique coffee shops and original street art, and a place where local artists have an opportunity to share their work. After you've finished the visit to the LX Factory you can return to the river bank and continue your walk there. You'll soon reach Torre de Belém, also called The Tower of St. Vincent. It was built in the 16th century and until today remains a beautiful historical monument. Pastéis (pl.) are the most traditional Portuguese sweets – small egg tarts that you can eat for breakfast or as a snack any time of the day. They were originally invented by monks. Walking into traditional pastelerias around Portugal you'll soon discover they love to make their sweets with egg yolks and a lot of sugar. Delicious! When you feel like you've had enough of the cultural explorations and your belly starts demanding food, stop for the famous Pastéis de Belém. Across the station from which you can take a tram back to the city, you'll find an adorable shop which is always full of customers, both tourists as well as locals. There is a good reason for this: pastéis de Belém is one of the best ones you can try in Lisbon. Some say you can get even better ones in Baixa-Chiado, but that is a personal preference – depends if you like your egg tarts creamy and juicy or more crispy. This content has been entered in the Erasmus Travellers Competition and have earned 865 points.